Hate the Sound of People Chewing? There's a Name for That. Does the sound of someone slurping down a thick soup or crunching on a chip make you want to die? Good news: you're not alone! Bad news: people are gross and will continue to make awful mouth noises. The hatred of commonplace mouth noises like chewing or lip-smacking, and other sounds like the click of a pen, nail-clipping, or typing is a real condition called misophonia. Slate investigated misophonia, and found that, while there's still not a ton of research out there, there are plenty of people that suffer from it -- in fact, there are even Internet support groups dedicated to it. 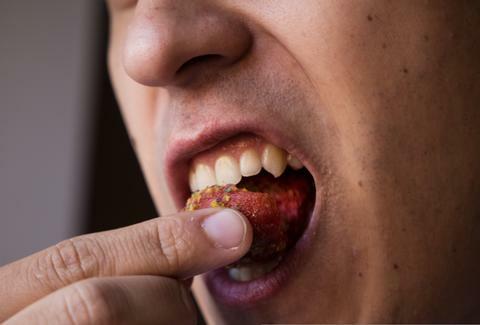 A lab at UCSD was contacted by one misophonia support group, and, upon interviewing members, found that they all had strong reactions to "chewing, mouthy sounds." Doctoral student Miren Edelstein exposed both the misophonia sufferers and people without the condition to sounds like chewing, sniffing, and lip-smacking, and found that both groups had negative reactions to the noises -- the misophonia sufferers' reactions were just a bit stronger. So, basically, everyone thinks your mouth noises are disgusting. Edelstein also found that those who had intensely negative reactions to the noises were well aware that their response was "inappropriate." In fact, many of them have actually tried different coping mechanisms that range from using headphones, to altogether avoiding situations where the noise might occur. A research team from the University of South Florida studying misophonia found that 20% of 483 psychology students surveyed experienced the same extreme symptoms. Many find misophonia so distracting, it disrupts their work. Other studies have shown misophonia can be linked to anxiety, depression, and OCD -- though some researchers (including the people who coined the term) think misophonia is no psychiatric condition at all, and instead is a type of "decreased sound tolerance." Either way, it seems most people can agree that keeping your mouth noises to a minimum would be ideal. Slurp your soup in the privacy of your own home, Gianni. Lucy Meilus is a staff writer for Thrillist and strongly believes there's nothing grosser than the mouth noises people make when they wake up. Follow her on Twitter at @Lucymeilus and send news tips to news@thrillist.com.